Take a look at this submission from Bob. A great suggestion for [tag]free basketball dribbling[/tag] drills that can work with all age groups. Dribble and Passing warm up [tag]basketball drill[/tag]. Start with half the players on the outside of the circle with a ball. The other half are inside the circle. Players work for 30 to 60 seconds then rest. Players on the outside will throw a chest pass, player on the inside checks to the player on the outside asks for the ball,receives the ball and then plays the ball back with the prescribe pass. The player then finds another player on the outside and executes the pass. Players must solve the time and space dilemma and are able to perform [tag]basketball passing drills[/tag] under pressure. I will work this for chest, bounce, skip, and over takes. Next I move to dribbling. I keep the circle. I put 6 on the outside and 4 on the inside. The players on the inside have a ball. In addition, I put 4 cones or discs in the middle of the circle forming a box, or what I like to call a window. Players are then given a type of dribble to perform with a type of crossover move. Right, Left, front cross, behind the back, between the legs. Players in the middle start dribble through the square with speed and look to find an open player on the outside of the circle. They execute the dribble move, get their head up, find a player open, pass then the ball. The player on the outside receive the ball, the player who threw them the ball comes at them and the player receiving executes a cross over move to beat the player, dribbles as directed in one part of the square and out the other side and locates another player and executes the same. A very continuous drill. I can then add on the following. 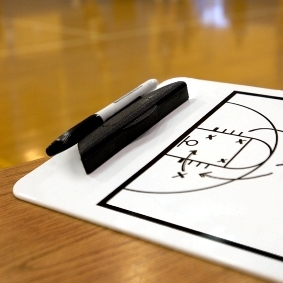 I can arrange player at the top of the keys in the gym and the play can play the ball to them cut to the basket and execute a pass and hit the shot, gets his rebound plays the player, and the player continues through the “window” and finds a player to execute a give and go. The combinations are limitless. The kids like it, we are working skills at speed with pressure, with a number of players in the same area which causes the kids to make good decisions with the [tag]basketball[/tag]. Great for fitness and handling pressure.